Head to the NH Fish and Game Wildlife Action Plan page. This page gives you an opportunity to read the whole Plan, or just parts of it. Key chapters include those on how we identified and chose SGCN (Chapter 2) and evaluated habitats (Chapter 3). You'll find important Information about threats to both species and habitats in Chapter 4, including an explanation of the 11 major threat categories impacting wildlife and habitats in New Hampshire. Chapter 5 has the broad overarching strategies that we all can help implement to benefit our state's wildlife. You can download and read all the profiles for wildlife species identified as SGCN in Chapter 2 of the Plan, but you might find it easier to cruise over to the Species Occurring in New Hampshire page. There, you can click the name of the species you're interested in learning more about. 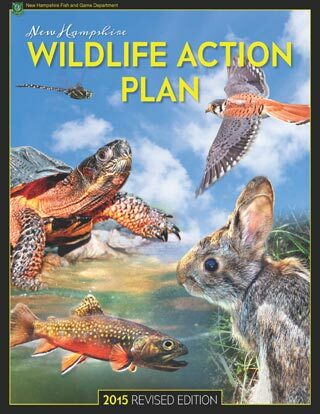 For some species, this will take you to a fact sheet including status and natural history information; the Wildlife Action Plan Species profiles are found in a link at the bottom. For the rest of the species, the link will take you right to the species profile. Links to these fact sheets and species profiles are also found on the Endangered and Threatened Wildlife of NH page. Want to know about some of the work that NHFG is doing to protect and restore wildlife species? Head to the Nongame and Endangered Wildlife Projects page. You'll find information and research on piping plovers, Karner blue butterflies, New England Cottontail, Blanding’s Turtles and more! To get familiar with the habitats identified in the Wildlife Action Plan, visit the Habitat Types and Species page. Click on the habitat you're interested in, and a box will appear with three tabs of information: Habitat – a description of the habitat, Species - a list of the species that use that habitats (with links to profiles), and Learn More - links to the Wildlife Action Plan habitat profiles, Habitat Stewardship brochures, and other information. If you're interested in learning more about habitat projects, visit the Fish and Wildlife Habitat in New Hampshire page. To find out what actions you can take to help New Hampshire wildlife, go to Taking Action for Wildlife and, on the sidebar to the left of the page, click on Actions You Can Take. There, you can access three handouts that pull together actions for communities, landowners and land trusts to take. The first page of each handout includes 5 key actions – some simple and some complex. For example, the top action identified for communities is to do a Natural Resources Inventory of your town. An NRI identifies the important natural resources from wildlife habitat to drinking water to favorite trails that occur in your town and that you may want to consider protecting through acquisitions, zoning ordinances or overlays or other mechanisms. On the back of each handout are more actions you can take for wildlife. Feel free to print these and share them with others. In many sections of the Taking Action for Wildife website, we have incorporated updates from the Wildlife Action Plan into information on the work that communities, conservation organizations and land trusts can do. Some of these changes are subtle, so visit this site often! If you want to know what others have done, download the Communities Take Action for Wildlife and Landowners Take Action for Wildlife brochures, or visit the Stories Page. Part Two of this article will appear in a later edition of the Taking Action for Wildlife newsletter, when there are more updates available that make it easier for you to access information from the NH Wildlife Action Plan.